Hong Kong has long been known as an international business hub, frequented by wealthy businessmen and tourists with the requisite high-end hotels, restaurants and retail. With over 225 hotels and approximately 70,000 rooms, there is considerable competition in the city for visitors and so hotels rely on a variety of differentials to attract and keep their clientele. One of those differentials is customer service. Customer service is more important than ever before, especially during difficult economic times, when customers are looking to increase value for money and are less forgiving of mediocre service. A 2011 study found that seven in ten Americans are willing to spend an average of 13 percent more with companies they believe provide excellent customer service. Three in five would try a new brand or company for a better service experience. Benchmark hospitality organizations spend considerable time and money teaching a culture value system so that when a situation with a customer arises that is not discussed in the training manual or can't be done by the book, the employee who has learned the culture will know how to do the right thing at that moment, will want to do the right thing, and will be empowered to do so by the organization. These companies know that there is a clear link between training and levels of customer service. 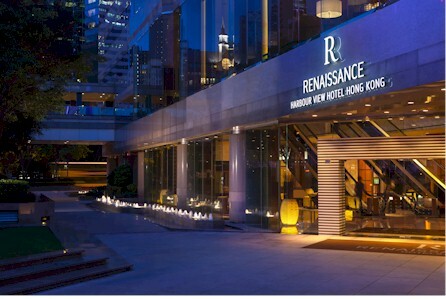 Hans Loontiens is General Manager for the Renaissance Harbour View Hotel Hong Kong – a Marriott property on the island. Loontiens understands the critical importance of training, and brings in outside experts - Bob Brown and Cynthia Goins - to enhance customer service training at the five-star hotel which houses 805 rooms and 52 suites over 42 floors. These experts 'provide the icing on the cake' says Loontiens. As well as working as a seminar leader and management consultant for restaurants and hotels, Bob Brown is a leading keynote speaker and author. His book, Little Brown Book of Restaurant Success, is an international bestseller which outlines the strategies, tools and techniques he advocates to high-powered customers such as Disney, Ritz Carlton and Hilton as well as Marriott. He was influenced in his early days while working in top restaurants in the US. Cynthia Goins' firm, CJ Goins & Associates, has been working in hospitality for over 30 years. Their mandate is 'passionately exceeding expectations' in order to differentiate a destination with wow factors and emotional connections with customers. These service experts help Hans Loontien's team develop the real passion and 'Spirit to Serve'. Frontline ambassadors review each day's arrivals in advance, check on any previous comments and react accordingly. 'For example, if a particular female repeat guest needs more recognition - she needs to be given more face – therefore she is met by a senior manager and escorted to her room,' says Loontiens. If any of the arrivals are Platinum members, they will receive their guaranteed room type, access to the Club Lounge and a Platinum gift – all intended to make them feel special. Wow factors for Renaissance clients include cold bottled water in their valet-parked cars on hot days and coat hangers placed in their cars to hang up jackets. It's like having 'Mom' look after you. If there is a group booking, staff members make efforts to find out about favorite snacks, the boss's beverage of choice and any birthdays in the party – for which they provide cakes. It is not just the managers who can implement this.